University students have developed a computer game that is operated by eye movements, which could allow people with severe physical disabilities to become ‘gamers’ for the first time. The students, from Imperial College London, have adapted an open source game called ‘Pong’, where a player moves a bat to hit a ball as it bounces around the screen. The adaptation enables the player to move the bat using their eye. To play the game, the user wears special glasses containing an infrared light and a webcam that records the movement of one eye. The webcam is linked to a laptop where a computer program syncs the player’s eye movements to the game. The prototype game is very simple but the students believe that the technology behind it could be adapted to create more sophisticated games and applications such as wheelchairs and computer cursors controlled by eye movements. One of the major benefits of the new technology is that it is inexpensive, using off-the-shelf hardware and costing approximately £25 to make. Eye movement systems that scientists currently use to study the brain and eye motion cost around £27,000, say the researchers. Researchers in Dr Faisal’s lab are now refining the technology so that it can monitor movements in both eyes. This would enable a user to carry out more complicated tasks such as plotting a journey on screen. 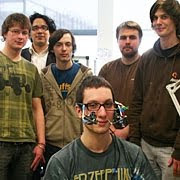 This might ultimately allow them to use eye movements to steer a motorised wheelchair.